Themed "Connecting Worlds - Strengthening Cohesion", the initiative "Germany - Land of Ideas" of the Federal Government promoted 100 projects with lighthouse character for Germany in the competition "Excellent Places in the Land of Ideas. The Aachen „Engineers Without Borders Challenge“ has been appointed as such a place, competing with 1,500 other applications. As part of the teaching concept "Engineers without Borders Challenge" students tackle real-life problems from developing regions. 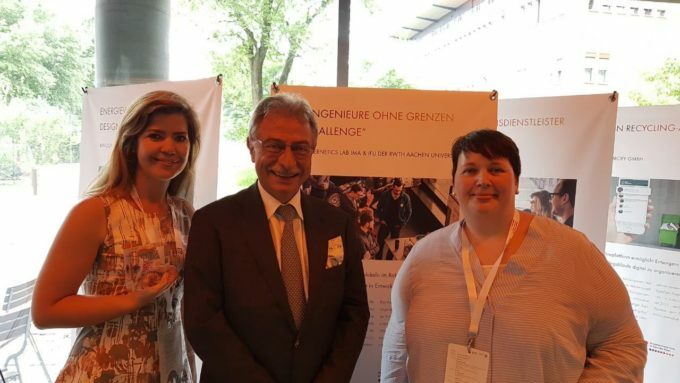 Together with Ingenieure ohne Grenzen e.V., the challenge has been included in various interdisciplinary courses at the Cybernetics Lab IMA & IfU at RWTH Aachen University since 2013. In the winter semester 2017/18, for the first time a joint final event was held at the TU Dortmund. As demonstrated in recent years, the young engineers are becoming aware of the social responsibility of their profession through the „Engineers Without Borders Challenge“. The teaching format is a method in the BMBF-funded joint project ELLI 2. As part of a festive event, the prize was awarded on June 4 in Berlin to the person responsible for the project, Dr. Kathrin Schönefeld. We are very pleased that the challenge (and thus Aachen and Dortmund) is regarded as a future-oriented place for ideas and innovations, where high-quality and creative responses to urgent social issues are delivered. The jury chairman Prof. Dr. Michael Hüther emphasizes that the selected projects have a high signal effect on German society and provide significant trends for sustainability. The competition originated from the event series "365 Places in the Land of Ideas", which started in 2006, and since 2013 has been rewarding projects under annually changing themes. It is a joint initiative of the Federal Government, the German economy, represented by the Federation of German Industries (BDI), and Deutsche Bank AG. For further questions, please contact Dr. Kathrin Schönefeld, group leader.